We’re coming up on Valentine’s Day, and no matter how you choose to spend it, the odds are that it will involve chocolate. 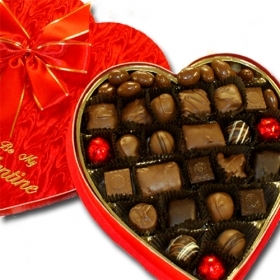 USA Today reported that chocolate sales for Valentine’s Day 2009 totaled almost $15 billion. That’s pretty unbelievable. That’s a lot of chocolate. But do you know how your chocolate gets made? Better yet, do you know who makes your chocolate? Where it comes from? If you are buying one of the popular brands or one of the cheap brands, then chances are great that slave labor is involved. We take for granted all the options we have here in the US. You can splurge or you can pinch pennies, but either way, there is a choice for you. This choice is taken away from many of the people who pick the cocoa beans, and start the supply chain of what ultimately ends up in our bellies. I don’t tell you this info to bring you down, or be a buzz kill, or ban chocolate. Believe me, I looooovvvveeee chocolate. In fact, I pretty much don’t care about any other kind of candy unless it has something to do with chocolate or peanut butter. And the more they marry, the better. But I do want to be a good citizen of the planet. I do want my choices to better the lives of others, not make them worse. And I can do that every time I make a purchase, and so can you. I’m pretty impressed by the CNN Freedom Project. I love seeing them put their reputation and resources behind something so worthwhile. Their recent expose on the hidden costs of chocolate were not unfamiliar to me, but they did put a face with the issue. I’m going to do a better job of choosing chocolate, and hope you will consider it, too. Please buy chocolate that is labeled “fair trade” or carries certification by the Rainforest Alliance or Utz sustainability programs. You can also use apps like Free2Work or Fair Trade Finder. I learned several years ago…no matter what the product is, if it’s really cheap, then the chances are that someone, somewhere is paying the price. You’re going to be a consumer, no doubt about it. Just be an educated one. I get the fact that most all of us live on a pretty strict budget. And I get the fair trade products typically cost more. But two things: first, if those were the items in demand then the price would go down, and second, now that I know better, I can’t choose to look the other way. On February 14, you can show a lot of love just by choosing a better chocolate. Happy Valentine’s Day! Categories: Social Justice | Tags: child slavery, chocolate, fair trade, human trafficking, Kristi Porter | Permalink.